I shot this a few weeks ago up in Seattle. Peter man was driving and I held the camera on the roof and tried to keep it still for the second long exposure. This was a really cool floating bridge that went across Lake Washington. Bill Gates' house was in view to the left so I kept on calling it the Bill Gates bridge. I recently got an email from a very nice and curious lady who wanted to know what kind of bird is pictured. I took the photo at the San Diego Wild Animal Park, but I have no idea what kind of bird it is! Anyone know? Anyone? Leave a comment! Don't ever mess with my wife. She's armed. She has a good shot. And boy will she mess you up. 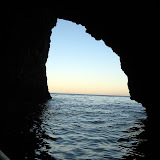 So the sailing trip to Channel Islands was totally awesome! I had quite a few experiences that I'm not even going to try and explain because words and photos just don't even begin to do it justice. Lets just say it involved me, alone, scuba diving, night, total darkness, underwater sea caves at 50 feet deep, swirling water with lots of surge, and lots of little (and big) sea creatures to keep me company. Good times. What a world we live in. There is so much beauty everywhere, we are blessed. Anyway, my underwater housing ended up not being done before I left, so I didn't get to take any photos in the water. But it was totally fine because I kept busy doing lots of other stuff! I am almost done with a nice slideshow from the trip, but for now I'll just post one photo that I like and it has a good story behind it too. We were all on the sailboat having a good time and I wanted to take some photos after the sunset on shore, so I hopped in the dingy and cruised onto the island. That was fun trying to juggle 2 cameras and 2 tripods in the dingy without getting them wet. And the craziest part was getting through the surf safely so I could pull the boat on shore. I got on shore with a wet body but thankfully dry cameras. So I was shooting for about an hour when my friend Taylor yells to me from the boat, "Blaine! We all want to cook some lobster! Come back to the boat and lets get these lobsters on the BBQ!" Fresh lobster that I had caught the night before sounded quite nice, but I wanted to do more shooting. Hmmm... decisions decisions. Well I had the genius idea to set my camera for a 30 minute exposure and then come back later when it's done. Well, about 2 hours into the lobster feast I decided to putt back over and grab my camera from the island. As I was cruising on over, I thought to myself- Hmm I hope the tide was going out instead of coming in, because my camera was set up pretty close to the water. Well, luckily I had stuck the tripod legs pretty far into the rocks and sand because when I shined my flashlight towards the camera my heart skipped a beat to see the tripod was half submerged and the camera was just a couple feet above the waterline! Wow, that was almost a major disaster. Amazingly the camera didn't have a single drop of water on it. I hope my insurance company doesn't read my blog... haha. So with all that said, here is the photo that almost claimed my $5,000 camera and lens. It's not an amazing picture by any means I just like the memories it brings back. The blurry object in the middle is our sailboat. Stay tuned for a sweet slideshow... should be up tonight sometime! Tomorrow Bethany and I are driving up to Santa Barbara for a sailing trip to the Channel Islands! Were super stoked. Our good friend Taylor is going to be our captain! Lots of scuba diving, spearfishing, hiking, kayaking, eating, exploring, and relaxing is on the agenda! And of course shooting photos! I'm so excited because I'm picking up my brand new custom made underwater housing I ordered a couple weeks ago from the best guy around, Erik Hjermstad of Del Mar Housing Projects. So hopefully my first attempts at underwater photography turn out alright... I'll for sure post some stuff here after the trip! The pic below is one I took about 4 years ago, when I was in my first year of photo school at Brooks. The land in the foreground is Santa Barbara and the huge landmass on the horizon is Santa Cruz Island, the largest of the islands. This photo is tricky, because it looks like you could simply swim out there but it's about 13 miles off the coast of Santa Barbara!